Another chickpea based dessert to add to the ever growing collection! Sounds weird, sure, but one bite and you’ll be sold! 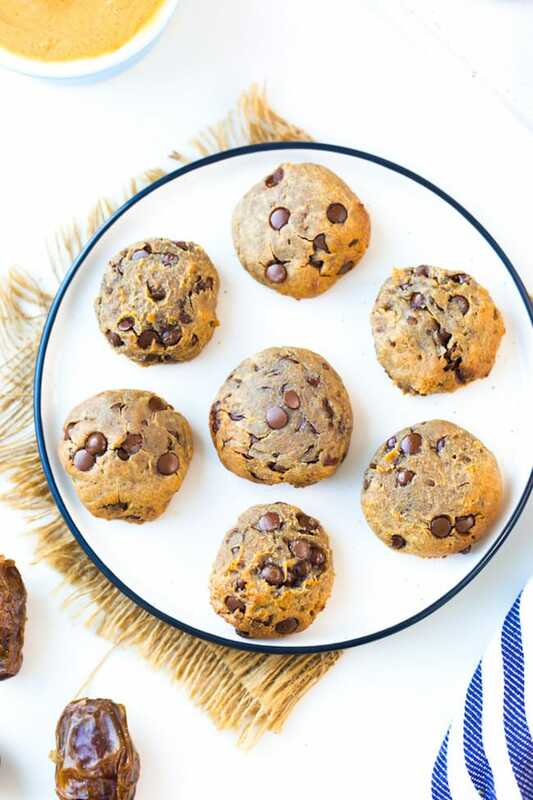 Altogether these cookies are super easy to make requiring only 6 ingredients and about 30 minutes to make! You will need a food processor or at least a very strong blender to make these, but so long as you have that these will be ready in no time. To get started simply add all of your ingredients (except for the chocolate chips) to your food processor and blend until you have a thick, smooth dough. This will take about 2-3 minutes to do. You may need to stop and scrape down the sides occasionally. Once the dough has been formed you can stir in the chocolate chips. This can be done while the dough is still in the food processor but I found it less work by moving it all to a separate bowl first. The dough at this point will very thick and sticky. Keep in mind that the cookies won’t change much after baking so how you place them on the tray is how they will look in the end. You can drop the dough on to the cookie sheet by the spoonful without shaping, roll into neat little balls or form flat little discs. Since the dough won’t spread much while baking you can fit quite a few cookies on the tray – just make sure to leave a little space in between each cookie so the air can travel through and bake these evenly. 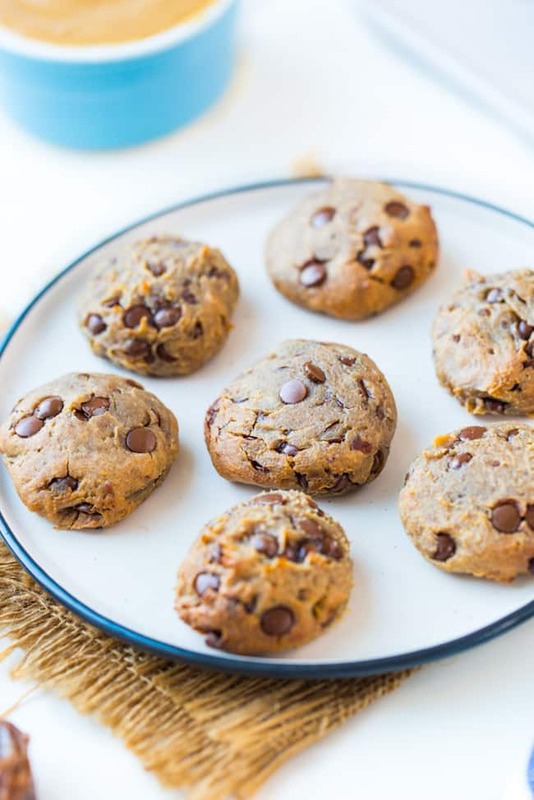 The end result is a cookies that’s soft, chewy and lightly sweetened. These are so soft that texture almost feels a little under baked which I personally LOVE in a cookie. These are also really great if you’re trying to cut back on too many sweets and snacks! Don’t forget to #asaucykitchen on instagram if you try these Peanut Butter Chickpea Cookies! We love seeing what you make! You can also post your pictures to my facebook page! Preheat oven to 350°F/175°C. Line or lightly grease a large cookie sheet. Set aside. Add the chickpeas, peanut butter, vanilla, dates and salt to a food processor and process until smooth. Stir in the chocolate chips. You can do this in the food processor by hand but I found it easier just to move everything to a separate mixing bowl. Scoop out the dough about 1 1/2 -2 tablespoons at a time. Keep in mind the cookies will keep their shape after baking so you can roll into neat little balls or just drop by the spoonfuls onto your baking tray. The cookies won't spread much so you can fit quite a few on your tray. Place in the oven and bake for 11-12 minutes until the tops have goldened slightly. Let cool on the tray a few minutes before moving then enjoy! *Instead of dates you can use 1/2 cup maple syrup or agave (for vegan option) or honey. Keep these stored in an airtight container at room temperature or in the fridge for up to one week. You can use any time of nut or seed butter that you like here (cashew, almond, sun butter, etc). These will not work with chickpea flour and have not been tested with any other type of flour. If your dates are looking a little dry let them soak for about 5 minutes in a bowl of hot water to plump back up. They will blender easier this way. I used mini chips here because I have a TON that need to be used by you can use regular chocolate chips if you prefer. These make about 20-24 cookies. When calculating the nutritional info I went for the average of 22 cookies and calculated them using dates. If you end up with a differing amount of cookies and use an alternative sweetener you can find the nutritional info for your specific recipe using MyFitnessPal. 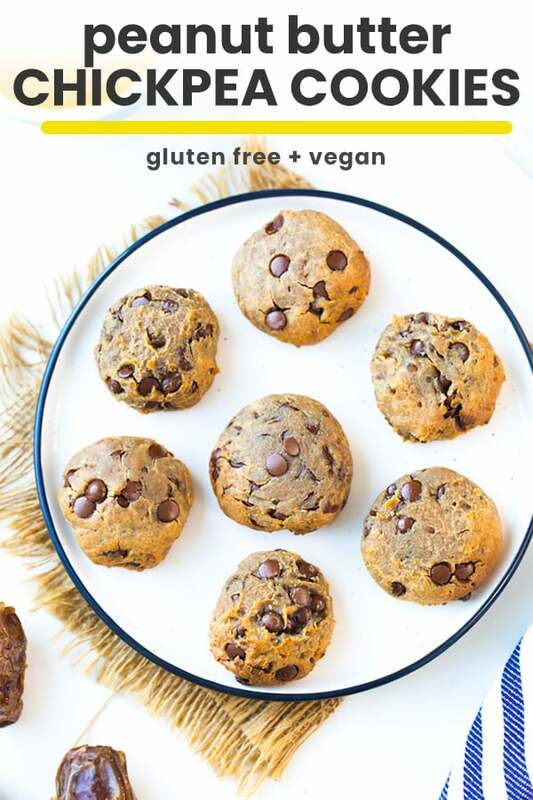 I would’ve never thought of using chickpeas in a cookie recipe! It’s definitely an interesting twist, I need to try this myself now haha thank you, great recipe! Thanks Bryan! Weird but definitely worth it! Hope you like them!